You will notice that I refer in a previous post on mitigation of solar farm in Nevada to the “Dry Lake” solar farm. (Amorgosa) and the mitigation plan refers to other locations all using or referring to Gold Butte as the offsite mitigation location. by the BLM and USFWS and in compliance with NRS 503.597 and NAC 503.093. The off-site mitigation of the Desert Tortoise demands that the turtle be relocated to abandon burrows and artificial burrows. The relocation cost to the farm will be $3,366,900 or $774.00 per acre for a total of 4350 acres. Do you think this is more than the grazing rights have cost landowners. Just think the politician says I can get more money mitigating the BLM land than allowing a rancher to pay for grazing rights??????? We must not forget the pale-kangaroo rat a multiple year study by a biologist will take place to determine the rats stress from the solar farm.$200,000.00 study. Payments into a tribal conservation fund for the desert tortoise at $786 dollars per acre (no acreage total identified) Bases on acreage purchased by ENN Energy it would be a potential of $7,000,000 plus or minus. 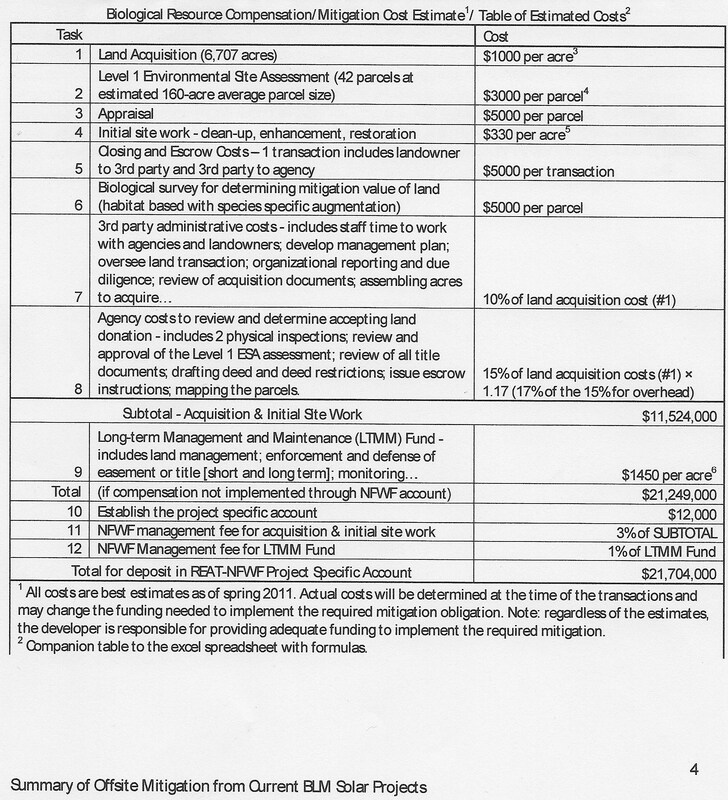 Long term maintenance fee $1450.00 an acre X 6950 acres = $100,775,00. There is another 12 million and some change on another chart, that I did not include, if you would like to see it click on the link at the top of this post to see the whole mitigation summary. Pay close attention to the other projects that are referenced for mitigation. It is not clear that they a doubling and tripling down on each project, but the way dollars are spent on conservation, I would say they are. Previous postHow the money works with mitigation…. Thank you again! Keep thumping on this one..! Check your cookies settings please! thanks for your comments.